When a family must select a mortuary, they look for one which has an established reputation for dignified, conscientious, efficient, and helpful service. We are extremely proud of the record of the Allen Mortuaries for this kind of service to the people of Cache Valley for over 70 years. It was July 1938, that the Hall Mortuary was established by W. Loyal Hall. With good business sense and a lot of hard work, the mortuary was expanded in 1962 with the addition of the present day chapel. James R. Allen and his family purchased the facility in 1975 and have continued to provide the quality service that the people of Cache Valley deserve. In 1993, a complete restoration and addition was added to what is now one of the most beautiful mortuary facilities in the Rocky Mountain Area. 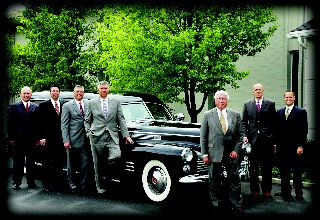 Again in 2009 the facility has been remodeled and updated into a beautiful peaceful mortuary.